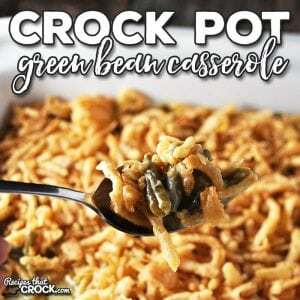 Crock Pot Green Bean Casserole - Recipes That Crock! 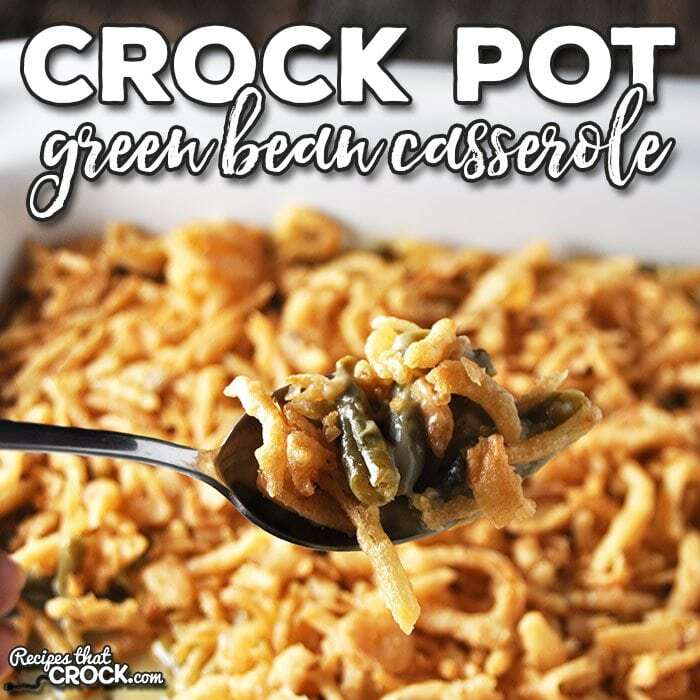 As much as corn casserole is a mandatory dish at our holiday meals, green bean casserole is another must-have when the holidays roll around! 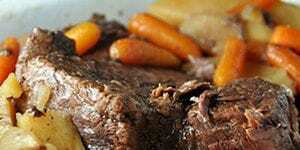 It is also a great comfort-food dish that will make any weeknight or weekend meal special. 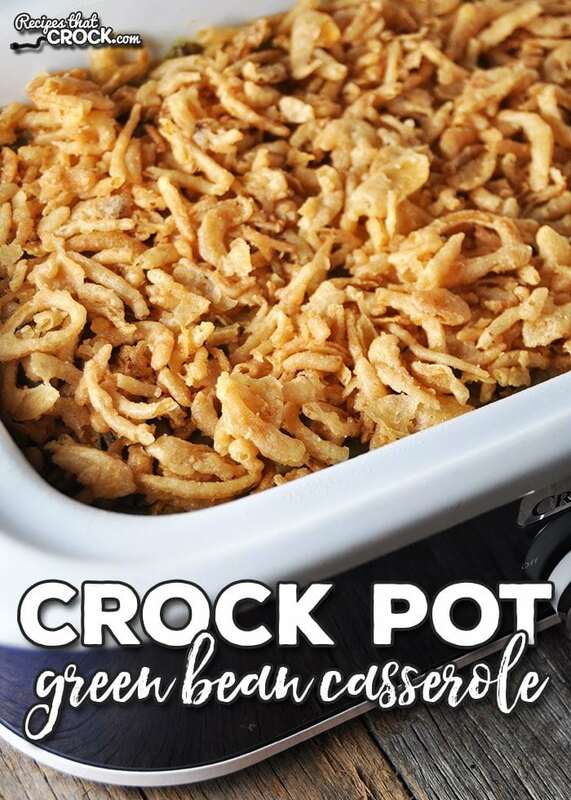 With this Crock Pot Green Bean Casserole, you can have your favorite side and not have to worry about making time for it to be in the oven! 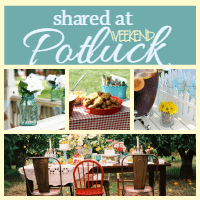 If you are a beginner (or short on time), this would be a great recipe to make! 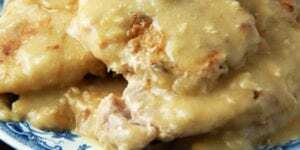 It is thrown together in less than 5 minutes and the crock pot does the rest! If you don’t want to use canned cream soup, you can make your own with this yummy Homemade Cream Soup Substitute or this Homemade Cream of Mushroom Soup Substitute. 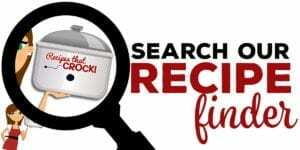 I pulled Cassie, my 9 x13 casserole slow cooker made by Crock Pot, out for this delicious Crock Pot Green Bean Casserole. She worked like a dream! You can use your favorite 3-4 quart slow cooker. If you don't want to use canned cream soup, you can make your own with this yummy Homemade Cream Soup Substitute or this Homemade Cream of Mushroom Soup Substitute. If I am using fresh green beans should I just cook it longer? I have not made this recipe with fresh green beans, so I don’t feel comfortable making a recommendation without testing it first. If you give it a try, let me know how it goes! Enjoy! I just made this recipe and it’s a little too soupy how do I make it a thicker consistency? I’m so sorry it turned out soupy! I did not have that problem when I made this recipe, so I can only guess at what happened. 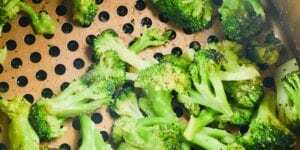 Did you drain your green beans completely? If you left no liquid in your green beans at all, and it was still soupy, then I would suggest taking the 1/3 cup of milk down to 1/4 cup of milk next time. I haven’t tried it this way, but that would be the only way to reduce down the liquid in this recipe that I could think of. Let me know how it goes! Mix a couple of tablespoons of cornstarch into the milk before you add it. If I were to use fresh green beans, what changes would I need to make? 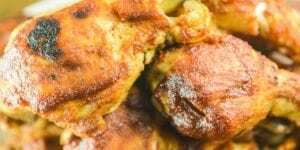 I have never tried this recipe with fresh green beans, so I would hate to give a suggestion that I have not tested (or have tested something very similar) in my own kitchen and have something go terribly wrong. Enjoy! I have not tested this recipe using fresh green beans, so I don’t want to make a suggestion on changes when I haven’t done it myself first. If you give it a try, let me know what you do and how it goes! Enjoy! I’m glad you posted this. I am taking green bean casserole to our family Thanksgiving meal. I didn’t think the 2 cans of green beans recipe I keep seeing would be enough. Not exactly sure how many people will be there (probably 15). I know there will be turkey, ham, dressing, mashed potatoes, deviled eggs, sweet potato casserole, cranberry sauce, rolls and a few deserts along with good ole southern sweet tea. In your opinion, would you make this with 3 cans of green beans or 4????? If 4, would I need to adjust the soup amount????? I know there is a lot of other food but nothing else green. Also, I am using French Cut green beans. Do you put “Cassie” in the oven at the end to brown the onions????? I’m thinking that would be so good! I could have it ready except for adding the onions then put them on top and put in my niece’s oven just before serving. What temp and how long????? 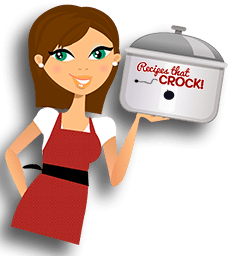 I have the casserole crock but have never used it. This might be how it gets done! Thanks and Happy Thanksgiving to you and your family! I would just make this dish as is for your feast. With all the other foods there, people will be taking smaller portions of each dish, so I would think you should be good. I haven’t tried putting it in the oven just after adding the onions, but if I were to, I would put it on broil (high if there is a choice of high or low) and watch it closely for 10-30 seconds. The onions should be browned in that amount of time and ready to go. When I do this recipe in a crock pot I brown my onions on a cookie sheet in the oven beforehand. Let cool and store in a ziploc baggie until you’re ready to sprinkle them on the casserole. Just leave the lid off so they don’t get soggy and you’re good to go. I think it could work in a 6 quart, but haven’t tried it yet. Make sure you watch it closely the first time you make to see how the cooking time is affected. Let me know how it goes! Enjoy! I did today just double the recipe. This looks delicious and easy to do. It is super easy! 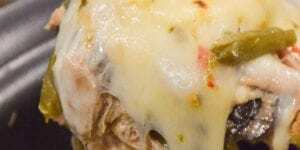 And even a few non-green-bean-casserole-fans have been converted with this recipe! I plan on taking it to Momma’s for Thanksgiving and Christmas! Enjoy!